Layout suggestions - 1966 ?? Below are pictures of the original layout and my currently planned layout for the 66 Globetrotter we just picked up. It's to scale although I didn't go so far as to make the radius of the curves in the corners exact. We like to have a dinette for playing cards and such, hence the small one on across from the galley. The larger will convert to a decent sized bed which can stay down when it's just the two of us - or can be a fairly large U shaped dinette if we have kids / grandkids joining. We want to salvage the bathroom layout and preferred to keep exiting venting for stove hood and fridge. Played with a few other variations that included moving some of that but none that were worth the extra effort so this is what we've concluded so far. I do not have technical expertise but I think your plan looks pretty good. Some of your dimensions are a bit confusing. I am not sure what they line up with. I like the dinette. It widens the galley walkway. The new bath door position frees up the storage and elongates the visual space. You may consider an L-shape sofa as the U-shape eats up a lot of floor space. Having an open floor area can improve the comfort and livability of the space. Especially when you have a houseful. It would still make up to the same size bed and seat 3-4. We had an L in our 28' CCD and it made into an extra-long full due to the wide body. I didn't update all of the dimensions after moving things around - that's why some of them are confusing. Great drawings. What program did you use to make them? It seems like the dinette in the middle would not have any room for your legs, considering the wheel well. I've seen a European remodel using a u shaped dinette over the wheel and a simple goacho in the front. You'd loose one of the closets though. Yeah, I thought that might be a problem. Hoping I can work it out somehow though. I'd think that a U there would take up too much space relative to the galley. Wonder what the dimensions were? I'll see if I can find the pic I copied. 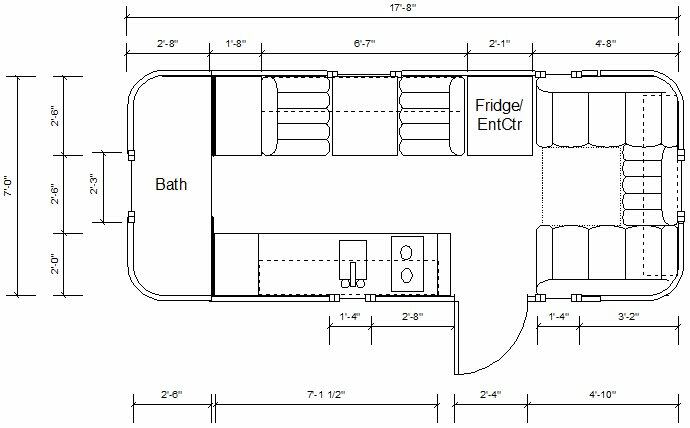 My idea on my 67' renovation was a full-time bed and full-time dinette. However, if these two areas needed to be converted into either a bed or couch, that can happen. But I believe there are a few things you always do in a travel trailer - that's relaxing, eating and sleeping. So in my design, I wanted an area to sit and sleep without having a conversion. Hence, the semi-permanent dinette and sleeping area. They are not large trailers and they will not be fitting for a large group. I recycled the curb-side goucho couch and retro-fit it into the front end cap making the bed. I am going to purchase a memory-foam futon mattress that can be folded up into a couch if the need arises. But I plan on keeping this area as a full-time bed. I say go with a design that suits the two or three primary users but make it user-friendly in case you have a few more guests! 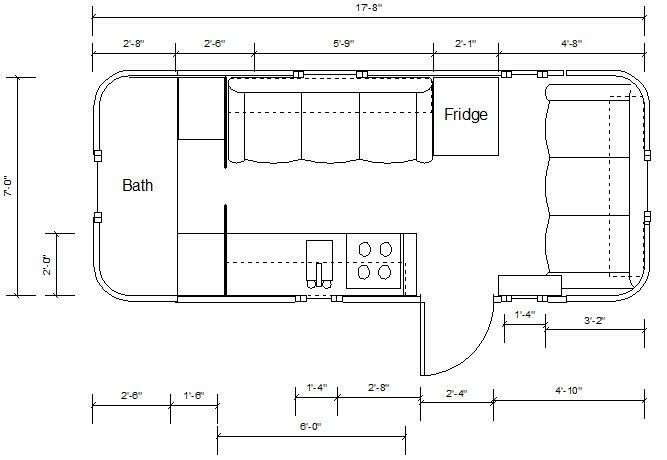 I'd think that a U there would take up too much space relative to the galley. Wonder what the dimensions were? Newer Airstream Sport 22FB's use a U-shaped dinette as well. Take a look at their specs/brochure online to find the dimensions. That trailer is slightly narrower than yours, so it should work width-wise. I'm sure this dinette takes up no more space than the twin bed does in my trailer. Maybe more than a goacho though. WWORX, I like your design. I am working on very similar plans for my '65 Safari. Those gauchos never made much sense to me. You are always sitting with your back to the windows that you should be able to be looking out of. As Breadbug mentioned the wheel-well will eat up some legroom below your side dinette. I therefore made my side dinette a little wider as a result; there is still ample walk way space. I originally planned a "U" shaped seating area up front, similar to yours, but finally chose a standard dinette there as well. The "U" shape doesn't really add any extra seating because no one can feasibly sit in the corners and you loose a bunch of table space. The "U" shape also forces you into a pedestal table which is likely a bit less stable. The "U" shape does have what seems to be a friendlier "conversation circle" feel to it. They each have advantages. If, you stick with the "U" shape plan, here is an idea. When I was considering the "U" shape, I planned a two table option. One full size table for dining that would drop down to make up the bed. And, a smaller "coffee table" size on a shorter pedestal that could be used for the cocktail hour, conversation circle mode. Great feedback so far. Please keep it coming. I'd prefer to work out as many issues in planning as possible rather than trial by error. This site is great!